Have you ever asked God a question and received no reply? Did you ever seek guidance from God and heard nothing? At eighteen, Kimi, though a Buddhist, vaguely knowing about God, addressed Him wanting to know Him. Though she heard nothing back, His invisible hand guided her life through others and Kimi's own choices. We often make life changing choices relying on our emotions but how different would it be if we sought His hand and be obedient to His Word. He is with us no matter what we choose, but less heart breaks and more blessings are ours if we pick the choice He has for us. 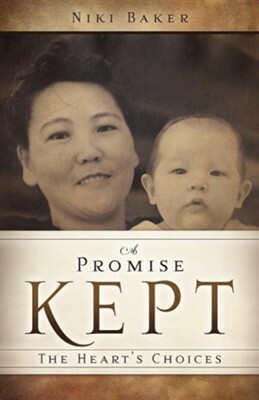 Close to seventy years later, Kimi attended a Japanese speaking church and in her own heart language finally understood His love for her. God never forgets our heart's desire of knowing Him. He keeps His promise. "For everyone who asks, receives. Everyone who seeks, finds. And the door is opened to everyone who knocks. Matt. 7:8 (NLT)" Within this true story is proof that God does come through with His promises and our right choices at the crossroads of our life truly does bring unexpected blessings beyond our expectations. Niki Baker, a retired special education teacher, lives with her husband, Robert, in St. Mary's County, Maryland along with two dogs and three cats. She is blessed with and proud of her three children: Katy, David, and Paul Jason (PJ). I'm the author/artist and I want to review A Promise Kept.